My secret joys (and struggles) show up in my gratitude books. You can see some of them here. But my list this week has sprung from my 9-day trip to Pennsylvania to visit family and take care of Mother’s house in mid-November 2014. In her devotional book One Thousand Gifts, Ann Voskamp begins with a chapter entitled Surprising Grace in which she discusses how she and her Farmer Husband “give thanks even when things look like a failure.” Or when one experiences loss. Health – I have an odd muscular neck pain (yes, pain in my neck!) yet I went up and down 3 flights of stairs from attic to cellar dozens of times, no problem. My sisters and brother – We sorted, boxed, laughed, cried, disagreed, but ultimately met the challenge on time. 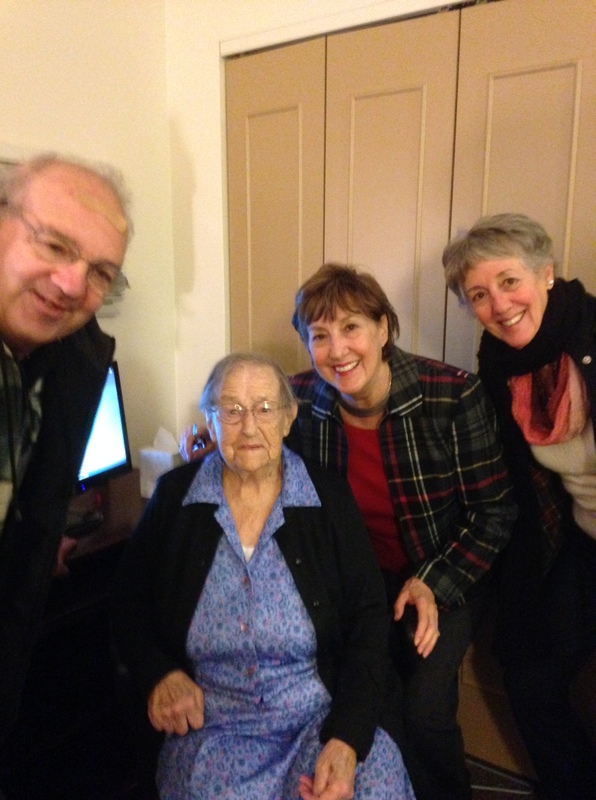 My Aunt Cecilia – She’ll be 100 years old in March, still going strong. We found Aunt Ceci cheerfully playing the Tumbling Blocks game on the computer beside her. “It keeps my mind sharp!” she laughs. A Mennonite preacher’s wife, Aunt Cecilia Metzler raised a family of five children on a Lancaster County farm. An heritage with spiritual depth – When my ancestors arrived in The New World, they brought with them the Holy Scriptures. 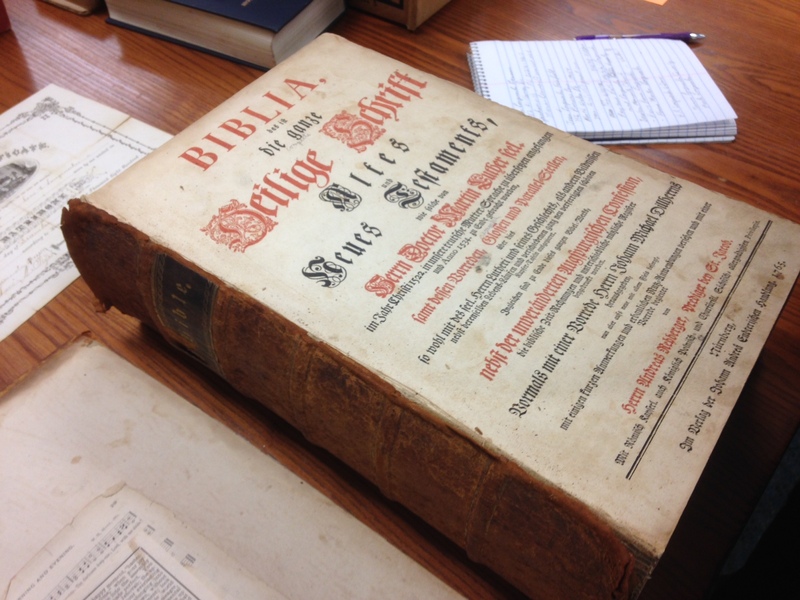 This one, the Nuremberg Bible, is dated 1765. The memory of my Mother – When Mother died, she still had a current driver’s license, paid all of her bills by check, and kept appointments on her calendar. She sent birthday cards to all her children, grand-children, and great grand-children, represented by names penned into the blocks. 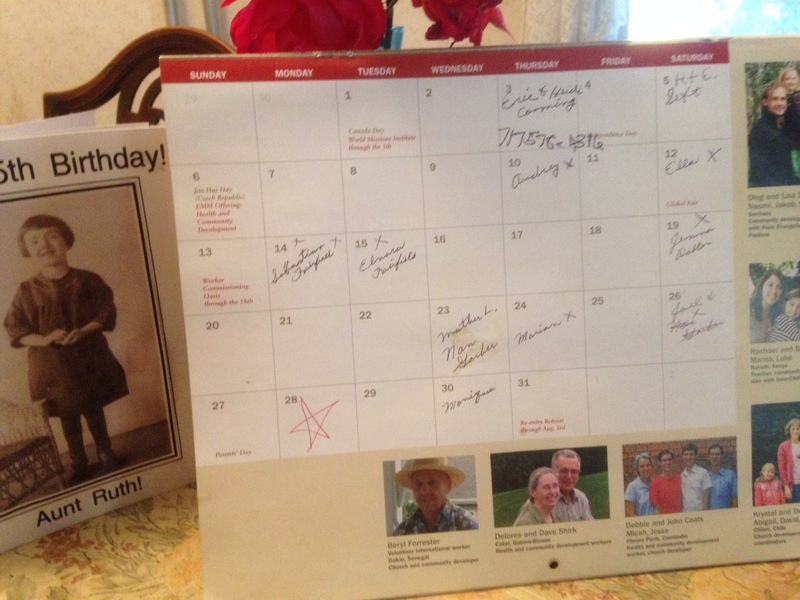 She died on the 28th of July, a date we marked with a red asterisk. My family – This photo is six years old, taken when baby Ian no longer needed a breathing apparatus. Just so you know: our daughter Crista is blonde, Joel, dark-haired. With the older boys now 11 years old, we are due for an update! And this is the law of the sacrifice of peace offerings that one may offer to the LORD. If he offers it for a thanksgiving, then he shall offer with the thanksgiving sacrifice unleavened loaves mixed with oil, unleavened wafers smeared with oil, and loaves of fine flour well mixed with oil. With the sacrifice of his peace offerings for thanksgiving he shall bring his offering with loaves of leavened bread. My conclusion: Gratitude brings peace and ultimately joy. What are you grateful for? Join me in naming your blessings. Previous postWhat Color Makes You Sing? This was a wonderful post covering generations. I smiled to hear Aunt Ruthie’s mind come alive with the memories. That happens to me and I’m not near her age. Just wonderful. I’m sure the phenomenon of a mind coming alive spans the generations too. When grandson Curtis was nine, he became fascinated with Pi and the periodic table. Don’t ask me why – just the curiosity of a child mind. I’m glad you enjoyed this post, Susan. Happy Thanksgiving to you and your extended family. Happy Thanksgiving, Marian. I loved this post. 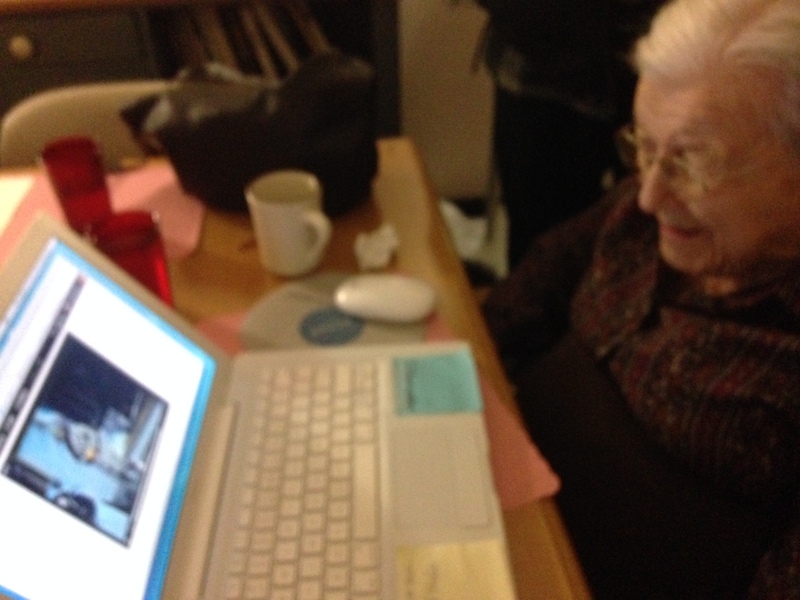 I love that your Aunt Cecelia plays computer games and is still sharp, and that your Aunt Ruth’s memories come alive when she sees the movies on the computer screen. Your family seems loving and close. Wishing you and your family all good things. Yes, our family is loving and close, but I haven’t seen Aunt Cecilia for a long time since we have been focusing closer home. She and my mother loved to play card games together. My mother never touched a computer except for my iPhone to scroll through pictures, which she was doing on my last photo of her. Now I’m clicking over to read your post, Merril. That is such a joyful photo of you by Aunt Ceci. No, you didn’t have to tell me that is you. I just knew. You have a beautiful family. I am thankful for friends like you who read and leave thoughtful comments. May you have a lovely Thanksgiving surrounded by family too, Georgette. Happy thanksgiving Marion. Sweet picture if all if you at Mom’s but sad to see it empty. Thankful that Mom didn’t suffer. She is so missed. I’m sure you enjoyed Aunt Ruthie’s joy of seeing the videos; she is so animated. I enjoy her so much. I praise God for the gift he gave me to be blessed so many years with the Longenecker legacy. Gloria, I am so glad you and your family have been woven into the Longenecker legacy. Now you are creating your own. Good morning, Marian. THANKS for the lovely post on Giving Thanks. I loved the Ann Voskamp reminder that we give thanks even for those events we term “bad.” I recall a recent Thanksgiving with my sons and g’kids when I realized for the first time how thankful I was for the 1968 race riots in Newark, NJ. Seems odd, yes? Because of those tragic weeks, my mother moved out of East Orange and into an apartment about forty miles away. The next summer, while visiting her, I met the man with whom I’d eventually have my two sons. SO, were it not for the 1968 rioting, which at the time was so devastating, I’d not have been surrounded by the people who now constituted my family. Sometimes, it’s the distance of time (not just space) that helps with perspective. May your Thanksgiving bring you joy and guilt-free pumpkin pie. I love the guilt-free pumpkin pie wish! This is certainly a day not to count calories. Happy Thanksgiving to you too. 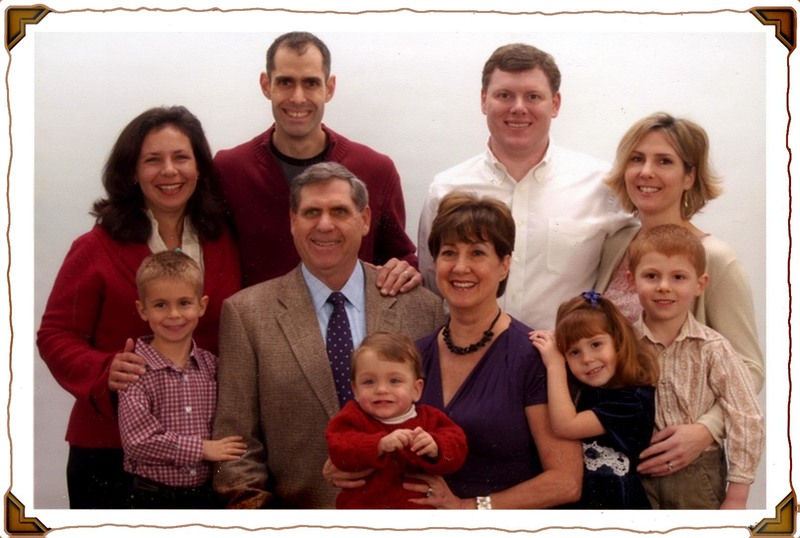 Marian … a lovely post about a family with powerful traditions. I think my favorite point was the Bible from 1765. My own family has lost any sense of its history past the late 1880’s, and even that is very sketchy. Thanks for commenting, Mary. You have a very interesting last name. I supposed you could start with that as a point of entry for exploring ancestry if you felt so inclined. I’m glad you liked the post, and as a scholar attracted to the literary part of my heritage. Happy Thanksgiving to you too! Gottschalk name is found around here a lot; we have some by marriage too, in our extended family. I am grateful for my health — body, mind, and spirit. I am grateful that I enjoy peace that passes understanding. I am grateful for the love of my family and friends. The attitude of gratitude sustains both of us. It’s the only way to live, I think you will agree. Happy Thanksgiving, Laurie! Marian, it is so nice to have such wonderful memories of family. I too have so many memories, and my family is small. Longevity runs in my family also, I am so thankful for family, close and extended, and health to enjoy it all. I have many memories of my Great Grandmother who passed away when my son, Ronnie, now 41 years old, was a toddler. My mother, who passed away a year ago in September, was the last person to really hold the family together, she was the glue. Family is so important, and to create so many wonderful memories is a blessing, and helps form who we are. I am thankful for a very long line of very strong willed women, that helped form who I am today. I can feel your pride in having such a strong heritage. And coming from a line of strong-willed women has favored you with courage and strength. So glad we can celebrate our first Thanksgiving together this year, Terry! A lovely post, Marian. I hope you have a wonderful Thanksgiving. Thanks for reading and commenting today, Joan. I hope tomorrow leaves you stuffed with good food, pleasant memories. A wonderful post! Happy Thanksgiving to you and to yours! Thanks for the good wishes. Blessings to you and yours this season too, Mimi. Happy Thanksgiving to you and your lovely family Marian I am sure you are so proud of them. I lost my Mum 10 years ago and it seems like yesterday …I am grateful to have known her. She suffered from ill health all my life but always encouraged me to read …reading is my life long love I’m a walking library …thank you Mum. I lost my Dad 9 years ago that also seems like yesterday . He believed you could do anything you want if you try …I believed him because it’s true, you might come across hurdles, but you get there in the end …thanks Dad . Thanks for an inspiring post . You are welcome, Cherry. I have seen reports that Thanksgiving is starting to catch on in Great Britain with the grocery chain Tesco leading the way. I do know that school children observe a Harvest day in your country to help the homeless and needy. I can see you have inherited perseverance from your parents too. I’m glad you commented today. Feel free to add to or correct any of my commentary about Thanksgiving. Yes, we have always had Harvest day usually in schools and churches. When my Son was as school we would contribute to hampers for the needy. I can always remember the aroma of fresh flower, fruit and vegetables along with the hymn ‘We Plough The Fields And Scatter.’ Such memories, thanks for raking them up . Cherry, I saw the comment about Tesco in the American media, so only you would know whether it is true. Your son learned a valuable lesson about giving with the Harvest Day tradition in his school. The hymn “We Plough the Fields and Scatter” is in my Mennonite hymnbook. Thanks for priming my memory. Your expression “raking up” memories is apt for this season too. Thank you, Cherry. I shared this post with Susan. She is very thankful for her family heritage and longevity. God is good, all the time. God bless and Happy Thanksgiving. Hi, Jerry. I’m thrilled to see you on my blog post today and glad we can connect this way. Thank you for the “follow” today as well. I hope you, Susan and family have a wonderful Thanksgiving! Happy Thanksgiving!! I love your list and the family picture is wonderful. So much to be thankful for every day. I believe you are observing the day in Spain, Darlene. Right? If so, I hope it is a day filled with lots of good food and pleasant memories. We celebrated Canadian Thanksgiving in October before we left. They do not celebrate Thanksgiving here (it is a North American thing) but they do however celebrate a number of Saint´s days with festivals and pageantry. They are always giving thanks to one saint or another. I plan to investigate further. Always something new to learn. I meant to mention, that Nuremberg Bible is very special. Thanks for the uplifting rendition of that great and wonderful song. I’m glad you took the time to listen to the song. I wonder if you remember hearing it played or sung long ago as well. As an author, you would enjoy the Nuremberg Bible. Thanks for highlighting it in your comment, Darlene. Oh yes, that song was heard often as a child growing up in the prairies. Great memories. ” . . . standing straight into wind is how to fly on His wings of grace.” Love this, thank you. Loved your blog. It inspired gratitude within me for your life and my glimpse into it. Happy Thanksgiving, Marian. That’s what I love about blogging – Writers offering a glimpse into their lives and thoughts, and readers reciprocating. Have a Happy Thanksgiving, Dorothy. Thank you, Anna Mae. Yes, it was difficult, but I was relieved that I did not have to do it alone. 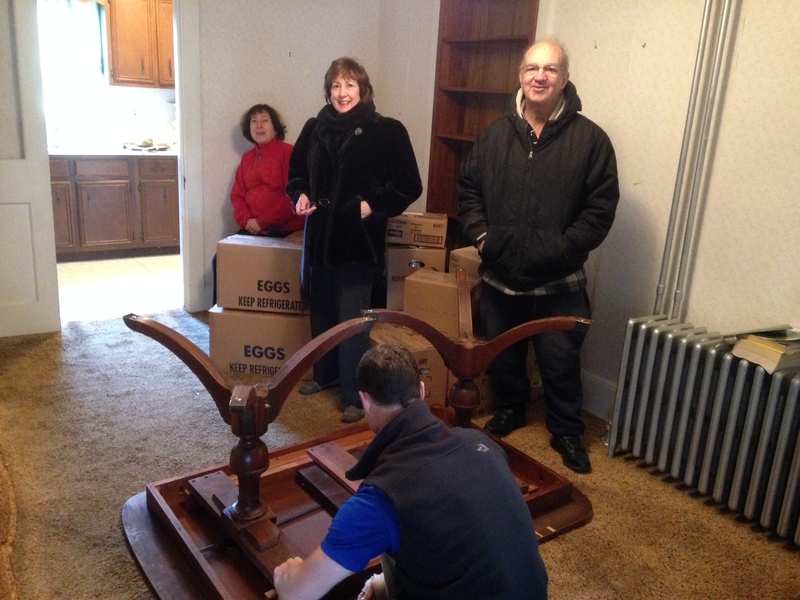 Mark helped with getting boxes, newspapers and bubble wrap along with frequent trips to the Thrift Store. Janice and Jean were by my side sorting and boxing. You probably went through this years ago with your own mother. Yes, she will be missed during this Thanksgiving and Christmas season. Welcome, Rachel – two cousins commenting here on the same day, lucky me! That has to be a record. Happy Thanksgiving to you and your family. Dear Marian, I know facing the task of cleaning out your mother’s home was difficult but you handled it with style and grace. What treasures you uncovered, especially the Bible.Thank you for this lovely glimpse into your life. You have a beautiful family. And thank you for these timely reminders of gratitude in good times and bad. What am I grateful for? My life with all it’s flaws and imperfections, my health, my family, my friends,my faith. ..and your blog for reminding me of all I have to be grateful for! Wishing you and yours many Thanksgiving blessings. Thank you for enumerating your blessings, Kathy, including my blog. I would add one more thing to your list: the successful publication of your memoir Ever Faithful to His Lead. Happy Thanksgiving, Marian! I have so much to be thankful for. You’ve helped me think of even more! Tomorrow is the big day! I’m thankful for my friendship with you! Thank you, Anita. I am so glad we met online too. Our friendship would not be possible without this connection. An attitude of gratitude – priceless! And, even when times get tough and they surely do, there is always something to remind us of our blessings, as for example, this beautiful post and the radiance of the photographs. Thank you. You have named your blessings, one by one, which I thing expands the gratitude. I like your expression, “the radiance of the photographs.” Your comments always add something special to the conversation, Susan. Thank you! I am grateful that I have not only my daily bread, but future portions as well. Happy Thanksgiving. I am happy you can look to the future with gratitude. A happy heart: such a blessing. Thank you! From your website, I see that you are Zambian transplanted to Vienna, Austria. What stories you have to tell. Looks like you have a wonderful family! Yes, my family is one of the things I celebrate this Thanksgiving season. Best wishes to you “across the pond”! You are always welcome here, Debby. So glad you enjoy reminiscing with our family. It’s quite a gang – ha! Feeling gratitude today after what grandson Owen called “the feast!” We held hands, all eight of us, and said what we were grateful for. We have “so, so much,” another Owenism. You have had an intense six months, have invested so much in the people of your family and in the best disposal of things. But the memories themselves are precious and can’t be taken away, especially now that you are sharing them here. I loved singing along with “Count Your Blessings” and remembering singing it more than 50 years ago at home and church. I smiled as I read how your legacy is taking hold in the words of little Owen: thankful for “so, so much.” Having just listened to David Steindl-Rast’s TED Talk, I too conclude that happiness emanates from gratitude, not the other way around as many erroneously believe. Enjoy the rest of your visit in Montclair with your growing, grateful family!